Earlier today at Hexagone Lounge in RCBC Plaza, Makati City, USANA gave select bloggers and media a glimpse on its newest product line - Celavive by USANA. Headlining the event was, Ms Aurora Gaston, USANA Vice President of the Philippines and Indonesia. Present at the event are Celavive Ambassadors, namely, Sam Pinto, Sara Jane Paez, Michelle Barrera and Misagh Bahadoran. 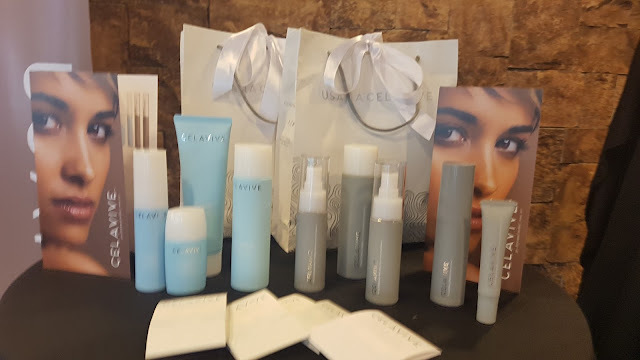 This USANA® Celavive™ line include USANA InCelligence Technology® to support healthy looking skin. InCelligence ingredients are included in the Celavive Cell Signaling Complex. This Cell Signaling Complex includes targeted ingredients to support the genes responsible for your body’s natural, beauty-preserving functions. InCelligence maximizes the potency and effectiveness of the plant-based ingredients included in the Celavive Cell Signaling Complex. Celavive skincare—with the help of InCelligence and Cell Signaling Complex—goes further and deeper to moisturize skin and help maintain the skin’s natural barrier function by enhancing cell communication. Celavive™ Perfecting Toner uses numerous natural plant extracts to keep skin clean and pure. These plant extracts include sakura cherry blossom extract, a unique plant-based seven botanical blend, and Olivol® Botanical Blend, a blend of botanical oils. This toner prepares skin for hydration with hot spring mineral water. Working together, these key components enable your skin to get clean, stay clean, and hydrate well in preparation for the next step. Celavive™Vitalizing Serum is age-defying and youth-preserving serum that uses a powerful formulation of peptides and botanicals to help achieve smooth and flawless looking skin. Celavive™ Creamy Foam is a sensational hydration and cleanser—formulated specifically for combination skin types. It can be tricky to hydrate, cleanse, and keep skin looking clear at the same time, but your skin can have it all with Celavive Creamy Foam Cleanser. The cleanser is designed with natural ingredients essential to enhancing your innate beauty. A special combination of sugars and salt harness moisture from within your skin to reveal a supple, well-hydrated appearance. At the same time, soapberry extract acts as a gentle cleanser. Celavive™ Gentle Milk Cleanser solves this dilemma by gently cleansing and moisturizing skin. Gentle Milk Cleanser’s active ingredients gently remove excess sebum and dirt, and help strengthen the barrier proteins of the epidermis to sustain healthy, hydrated, and beautiful skin. Gentle Milk Cleanser goes beyond just cleansing skin. It protects and defends skin from environmental damage. This promotes healthy moisture retention and helps cleanse toxins and impurities. Relieve your sensitive skin from harsh chemicals and greasy lotions with Celavive Gentle Milk Cleanser. Celavive™ Conditioning Makeup Remover lifts stubborn makeup from the skin while conditioning with sugar-based moisturizers. When makeup is not removed from the skin, pores can get clogged and the skin can become dry and irritated. This makeup remover pulls cosmetics from the pores and skin surface, to help keep the skin clean. It also moisturizes and prepares skin for cleansing with other Celavive skincare products. No skincare regimen is complete without a toner step. Toners close pores that have been cleansed of impurities, and smooth the appearance of your skin to uncover your youthful glow. Successfully finish preparing for the day by applying USANA® Celavive™ Protective Day Cream to freshly cleaned and toned skin. This formula provides ample hydration while shielding skin from the sun. Protective Day Cream is designed specifically for individuals with dry and sensitive skin. It leaves skin with a lightweight layer of moisture without feeling greasy. This day cream also boasts a sun protection factor (SPF) of 30 and PA++ to give skin plenty of protection from UV rays during the day. For oily skin types, look to USANA® Celavive Protective Day Lotion for day-long moisturization and protection from the sun. Protective Day Lotion is SPF 30 and PA++ to give your delicate facial skin a much-needed break from the sun’s damaging rays. This lotion is water based and very gentle on your skin. It’s formulated with basil extract, shea butter, and USANA’s Olivol® Botanical Blend. The lotion goes on the skin in thin layers and thoroughly moisturizes skin without adding grease or oil. USANA® Celavive™ Replenishing Night Cream is formulated specifically for the intense hydration of sensitive, combination, and dry skin types. Fine lines and wrinkles are visibly reduced after use, and over time, skin’s texture looks smooth and radiant. Calling upon ancient skincare practices, Replenishing Night Cream uses pearl powder to enhance skin luminosity. Oily skin is frustrating to hydrate. Often, topical creams and moisturizers leave skin greasy and shiny. Celavive Replenishing Night Gel is formulated with oily skin in mind, providing the best overnight hydration for oily skin. This gel contains unique and standard ingredients to hydrate skin. It provides moisture without excess oil. Some of the many benefits boasted by this night gel include the reduction of wrinkle visibility, smoothing the appearance of fine lines and rough skin. Hydrating Eye Essence helps by reducing the appearance of wrinkles and fine lines around the eyes. Crow’s feet and dark circles can be visibly diminished with consistent use. The ingredients in Hydrating Eye Essence help keep moisture locked into the skin’s cellular matrix. This moisturizing eye treatment preserves the skin’s youthful and healthy appearance. Want to firm, tone, and reinvigorate skin while reducing the appearance of wrinkles, fine lines, and pores? Treat your skin to rejuvenation with USANA® Celavive™Vitalizing Serum. This age-defying and youth-preserving serum uses a powerful formulation of peptides and botanicals to help achieve smooth and flawless looking skin. I am not at all familiar with Infinix but earlier at Brick and Mortar in BGC, I was introduced to Infinix Zero 5 Pro smartphone. I found out that Infinix is a Hong Kong-based smartphone maker. It was founded in 2013. The company's manufacturing center is in China. Theyhave local subsidiaries in over 60 countries. Infinix Zero 5 specifications: Android 7.0 and is powered by a 4350mAh non removable battery, a 5.98-inch touchscreen display with a resolution of 1080 pixels by 1920 pixels. powered by 2.6GHz octa-core MediaTek Helio P25 processor and it comes with 6GB of RAM. The phone packs 128GB of internal storage that can be expanded up to 128GB via a microSD card. Infinix Zero 5 Pro packs a 12-megapixel primary camera on the rear and a 16-megapixel front shooter for selfies. It has a dual SIM (GSM and GSM) smartphone that accepts Micro-SIM and Micro-SIM. Connectivity options include Wi-Fi, GPS, Bluetooth, FM, 3G and 4G. Sensors on the phone include Proximity sensor, Accelerometer, Ambient light sensor and Gyroscope. Infinix Zero 5 price exclusively for three months at Lazada: P13,999. Nippon Paint, world-renowned paint manufacturer, pioneered Asia Young Designer Award (AYDA), a prestigious design competition for the young architecture and interior design students, which has been running since 2008. The competition started in Malaysia in 2008 and has now expanded to 15 countries namely: Philippines, Singapore, Bangladesh, Thailand, Pakistan, Indonesia, Papua New Guinea, Vietnam, China, Japan, and Hong Kong, Sri Lanka, India and Taiwan. It was relaunched last year as Asia Young Designer Award to signal its emerging influence and scale in the region. In the country, AYDA Philippines started three years ago and has been growing its popularity and participation nationwide. AYDA is now in its 10th year, the competition is the company’s flagship CSR (corporate social responsibility) program that aims to encourage the next generation of design professionals to harness their talents, express their creativity, and fuel their passion for design. This year's theme, “You for Tomorrow: Future Living as Envisioned Today,” received over a thousand entries from participants in several colleges and universities nationwide. The theme tested both the technical ability and foresight of young architects and interior design professionals to create design concepts that fulfill the needs of tomorrow’s dwellers and societies. 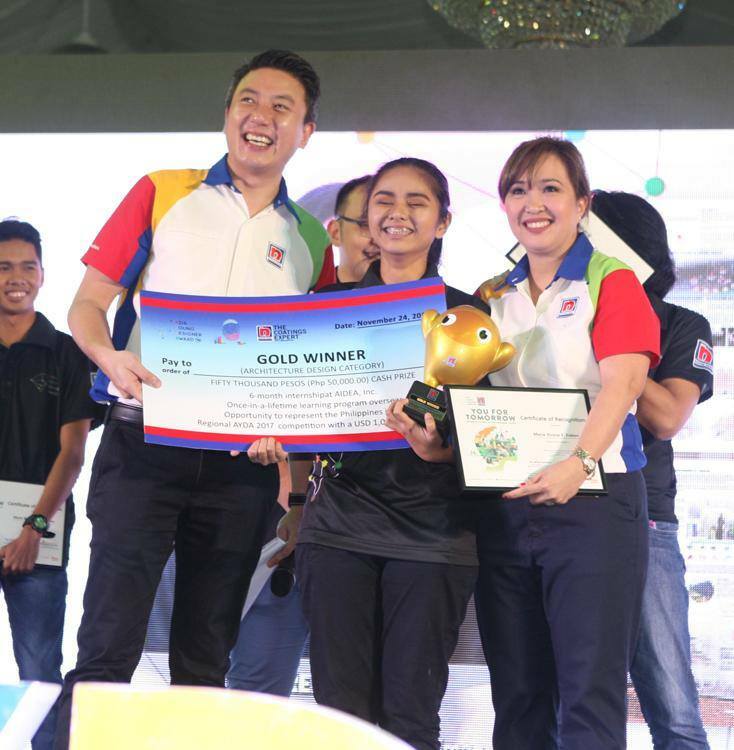 After the launch last July of its AYDA 2017 Philippine leg, Nippon Paint executives and industry practitioners announced the Gold winners during its awarding ceremony held on November 24 at The Elements in Eton Centris, Quezon City. the judges were composed of renowned and distinguished Filipino architects and designers from the industry. It also had renowned Malaysian Architect Boon Che Wee, Director of GRA Architects Sdn Bhd and President of Pertubuhan Akitek Malaysia (PAM), and award-winning Singaporean Interior Designer David I. Tay, Principal of ETHOSpace Pte Ltd. and recognized as one of the leading designers in Asia, as its first ever regional judges in the history of AYDA. All design entries were screened and judged accordingly until 10 finalists were chosen in the two categories: architecture and interior design. Gold and Silver winners, as well as Special Awardees in Best Design Innovation and Best Color Concept were also selected. Judging was presided by Architect Consuelo “Peach” Buencamino (Head Judge) and Architect Nina Bailon-Arce (Co-Head Judge), Architect Maria Benita Regala, Architect William Ti,Jr, Architect Boon Che Wee, Architect Veronica Villanueva, Architect Jose Ramon Carunungan, and Architect Chona Ponce; and, Interior Designer Wilfrid Magcase (Head Judge) and Interior Designer Michael Pizarro (Co-Head Judge), Interior Designer Belen Morey, Interior Designer Cynthia Almario, Interior Designer Ivy Almario, Interior Designer Cara Marie Marcrelo, and Interior Designer Rachelle Medina and Ms Mel Reyes for the Architecture and Interior Design categories, respectively. Through AYDA, Nippon Paint steadfastly leads in its advocacy to train and develop the minds of young designers. After the intense selection process, a total of 20 finalists prevailed, 10 from each category. 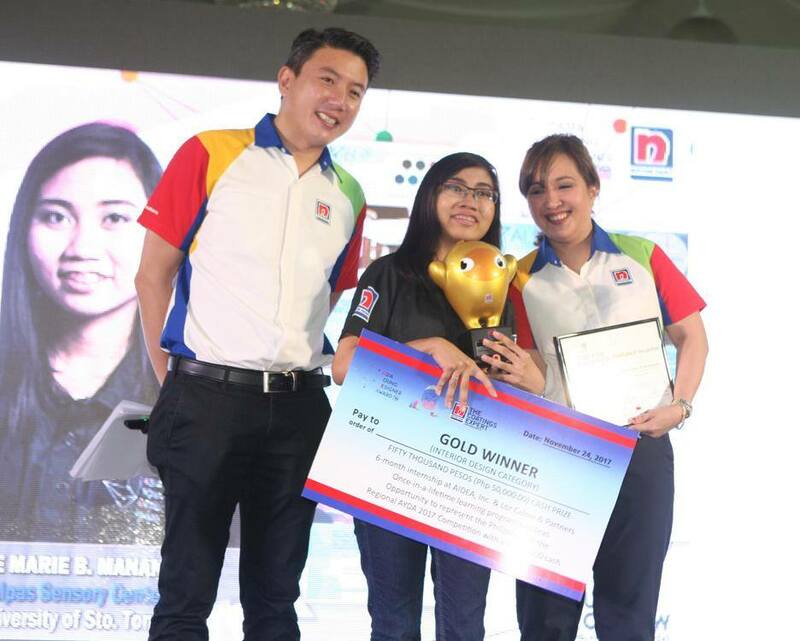 Gold winners in both categories bagged Php50,000 cash each, a six-month Internship with Casas+ Architects, Aidea Inc. and/or 8990 Holdings Inc. The Silver winners, on the other hand, individually got Php30,000 cash. The eight remaining finalists went home with a cash prize of Php10,000 each and special awardees for Best Green Innovation and Best Color were given Php5,000 each. Likewise, the Gold winners in both categories also secured their slots to represent the Philippines in the AYDA regional competition and get a chance to win USD1,000 cash. Moreover, there is the AYDA Learning Programme, an all-expense educational opportunity to meet and exchange ideas with the Gold winners of the other 14 countries (Malaysia, Singapore, Thailand, Indonesia, Vietnam, Hong Kong, China, Japan, Pakistan, Bangladesh, India, Taiwan, Papua New Guinea and Sri Lanka), and to attend exclusive sessions and lectures given by Asia’s leading Architects and Interior Designers. All of these events will happen in Malaysia next year, as coincidentally, the 10th year celebration of Asia Young Designer Award. At the end, the following bagged the major prizes: Architecture Silver Award - Edward Sarco, Eugelio Amang Rodriguez Institute of Science and Technology (EARIST), project Vinta Tahan and Gold Award was given to Marie Eirene Fabon of University of the Philippines - Diliman, project Bigkisan. Likewise, major wins were awarded to University of Santo Tomas students for the Interior Design Category: Marigold Martinez for project Mabote and Diana Marie Manansala for project Alpas Sensory Center. This competition was made possible by the supporting partners: United Architects of the Philippines, Philippine Institute of Interior Designers, Council of Interior Design Educators and Council of Deans and Heads of Architecture Schools. Internship partners are Aidea Inc, Casas + Architects and 8990 Holdings Inc. Notwithstanding the prizes, it is the accolade of taking part and being chosen as one of Asia’s gifted young designers that go with it that matters. Nippon Paint (Coatings) Philippines is part of the Nippon Paint Group, which is currently Asia’s No. 1 coatings manufacturer spanning 15 countries, and built on a heritage of over 130 years dating back to 1881 in Japan. In the Philippines the company has been operating since 2014 with a manufacturing plant in Light Industry and Science Park 1 in Cabuyao, Laguna. The Nippon Paint Group places strong emphasis in Research and Development (R&D) activities, which remains a core priority to its success in product innovation. As a global leader in coating technologies with a database of more than 10,000 paint formulations, Nippon Paint prides itself in being a Total Coating Solutions provider with a multi-segment portfolio of offerings ranging from Architectural, Automotive, Industrial, Protective to Marine coatings. The Group has been awarded the Best Company for Leadership in Paint Technology Asia by IAIR in 2014. The Group has also won consumer choice awards such as the Reader’s Digest Asia Trusted Brand Awards 2016 where it placed Gold in the Paints category. In its concerted effort to champion sustainability towards a greener footprint, the Group has been recognized with several Green Excellence Awards by Frost & Sullivan. I've been wanting to buy a condominium unit since 2002 but John is not sold to the idea of living in a box with so many neighbors. John was recently diagnosed with cardiomyopathy and his cardiologist advised a stress free living. Since our 3-storey house is located in a highly commercialized area, it is impossible not to hear the noise of the cars passing by. Hence, impossible to live a tranquil life. The idea of buying a condo still lingers in my mind but shun it. I was surprised when John told me to look for a condominium. Good thing we have a 3day-2night Sea Residences accommodation from the last event of Fil-Global we covered. We used it to check if condo living is for us. Thanks to Joseph for handling our booking. Thanks to JV for assisting us for check-in. After 3 days and 2 nights, have we decided to buy a condo? Well, before buying a unit one must check the pros and cons of condo living. 1. Condo living is attractive because of the sheer convenience it offers - near workplaces, shops, banks, and other establishments regularly frequented by people. 2. Less cleaning up to do. 3. The amenities are cool - swimming pool, gym, party venues, etc. 4. Safety - condos have guards and cctvs. 3. You have to dutifully pay those monthly payments, like common area dues, maintenance expenses, guards, etc. etc. 4. You will have to strictly comply with rules whether you like them or not. Going back to the question, have we decided to buy a condo? We might if the location and price is right. It was in college when my love for jewelries made of silver started. My collection was mostly dolphins and hearts anf flowers. When I started working I stopped buying silver and invested in gold for future investments. My love for silver has once again ignited when I won gift certificates at Very MOA Christmas. I claimed them yesterday at Thomas Sabo SM MOA branch located at Level 1. 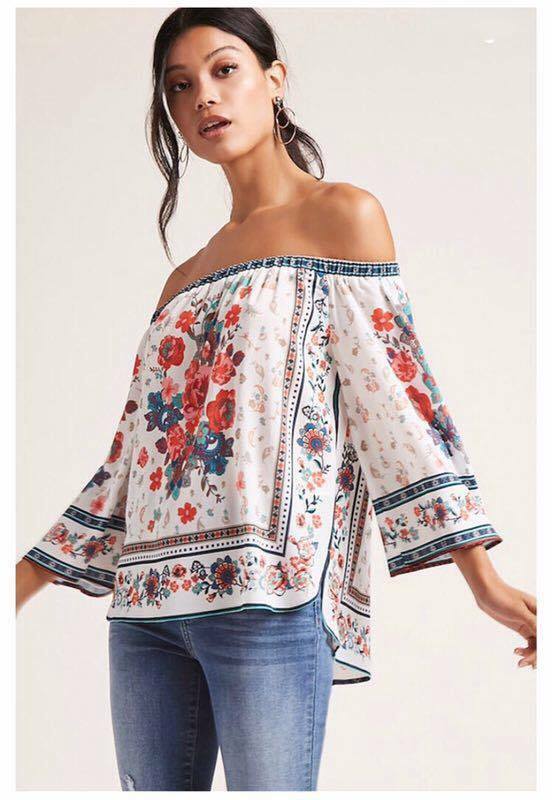 It actually took me 2 days to choose which item to get because all the designs are of the highest quality and designed beautifully. Thomas Sabo started in Germany in 1984. The name has stood for versatile, innovative and trendsetting jewellery. The unmistakable Sterling Silver collection, the Charm Club and the exclusive Fine Jewellery collection give the brand its face. 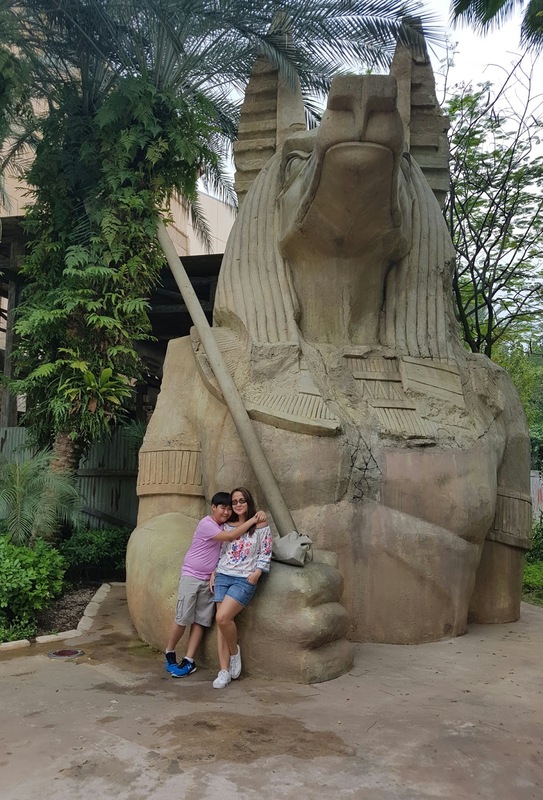 I have been at Yexel's Toy Museum at Manila Ocean Park twice because I accompanied my son, Juan, for his school field trip. I didn't like my experience back then because it was chaotic! Too many people! Madali din akong masawa sa lugar kaya I had no intention of going back but yesterday I accompanied my husband at Yexel's to utilize the 2 tickets included in the Hotel H20 overnight I bought at MetroDeal. Since John is a toy collector, he was happy to learn that part of the MetroDeal package I bought had Yexel's entrance tickets. The tickets can be use for 2 days but we didn't go on the first day because John saw the crown, too many people! Before checking out of Hotel H20, we had a quick tour of Yexel's. Amazing Stories of Yexel's Museum is the second toy museum owned by Yexel Sebastian, his first Toy Museum is located in Las Pinas. We were lucky to be the first two people to enter the museum. No long lines like what I experienced before. Well because we were there at 10am. No field trippers yet. How did John find Yexel's? He wasn't too happy. I have been meaning to feature Hotel H20 in this vlog since it opened in 2008. During that time it was very difficult to book a room since most would want to have the first experience. Last month as I was browsing the internet, I came across MetroDeal's Hotel H20 promo which costs only P3,699.00. Included in this promo is an overnight accommodation at Aqua Room and 2 tickets to Yexel Museum. If you book directly to Hotel H20 this would cost around P11,000.00 ++. How to we find this MetroDeal's Hotel H20 promo? We like that were able to save more than half of the actual price. We do not like that it was difficult to get the dates that we want since MetroDeal has a third party agreement with IndoChina, who actually handles the booking. How to we find this Hotel H20? We definitely like the room! The life-sized aquarium calmed our senses. Juan, who usually get bored easily, didn't have time to get bored because he was busy watching the school of fish going back and forth. The queen-size bed is big enough for a family of three. The cotton linens are soft and very comfortable to use. I like that they have high-speed unlimited Internet access. The swimming pool though is a different story. The water is dirty and has foul smell. As of this writing, we still have itch that we got after swimming. Nonetheless, we still recommend you visit Hotel H20 to experience that mesmerizing beauty of the marine world in a 25 to 35-square-metre room's main wall. Ching is my youngest sister, among 6 siblings. Her youngest son,Yuri is the youngest among 12 cousins. Ang galing diba! So, for Yuri's 3rd Birthday last November 18, we all headed at Jollibee Kapasigan to have fun and eat Chicken Joy! Who can ever resist Chicken Joy? Not me, definitely not me. My twin kids were born Sunday of December 8, 2002. It was a very special day for us because December 8 is the Feast of the Immaculate Conception of Mary whom we prayed for to conceive. 8 is also my favorite number. House of Representatives unanimously passed on third and final reading House bill 5241 declaring December 8 of every year a special non-working holiday in the entire country to celebrate the Feast of the Immaculate Conception of Mary as respect to the many Catholic Filipinos who believe in Mama Mary. Authored by Majority Leader and Ilocos Norte Rep. Rodolfo C. Fariñas, HB 5241 will be added among the country’s holidays marking Catholic religious events. The bill was endorsed for approval by the House Committee on Revision of Law chaired by Pangasinan Rep. Marlyn Primicias-Agabas. 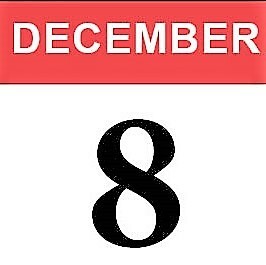 Under the bill, December 8 of every year will be a non-working holiday throughout the country to allow the faithful to commemorate the Feast of the Immaculate Conception of Mary, the principal patroness of the Philippines. The House official noted that Philippines is predominantly Catholic and is considered the third with the biggest population of Catholic faithful in the world. He said a 2013 survey showed that there are 76 million Catholic Filipinos. To honor its roots, Fino recently launched its Men's Line, aptly called, HIStory, at Dr. Wine in Makati. The event was graced by its owners, husband and wife tandem, Dr. Rommel Bautista and Rose Ann Bautista, and their HIStory ambassadors. 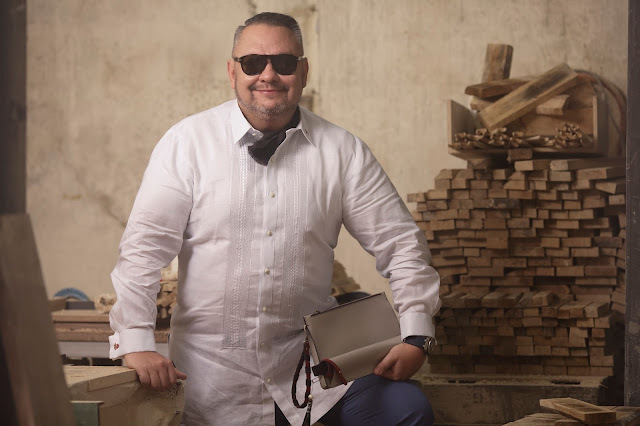 Fino Leatherware is a Philippine brand that started in the early 1990s and quietly emerged as a favorite brand among clients who look for endurance in quality and style. What's more to love about FINO? All the work on Fino leather goods is done in the Philippines. Meaning, the owners give livelihood for Filipinos. Fino bags sell for about P5,000 to P15,000, due in part to the labor costs from being handmade, and having some imported material but they do have a lifetime warranty, and one can have an item repaired by the store at a minimal fee. HIStory Collection by Fino is a brand that gives the owner a sense of fulfillment in owning one. During this collaborative journey, each man has given FINO an inside look into the workings of their minds. The result is a collection featuring intelligently designed pieces that are functional and yet creative and aesthetic, fulfilling current and realistic needs and demands of today’s fast, technology driven lifestyle. Through relevant and well thought out designs, each FINO piece is meticulously produced for the established, discerning Filipino. Seasoned restaurateur, Elbert Cuenca, has six restaurants including the acclaimed Elbert’s Steak Room, now on its 10th year and its spin-off, Elbert’s Sandwiches. His interest in good service and good food dates back to the 70s when his family was running a restaurant business. Possessing a love for car racing and a talent for biking, it is fitting to say that despite switching gears to a career in IT and marketing, the trail still brought him back to the restaurant business. When he wants to destress and relax, he travels with his wife to favorite destinations, as well as to new ones here and abroad. 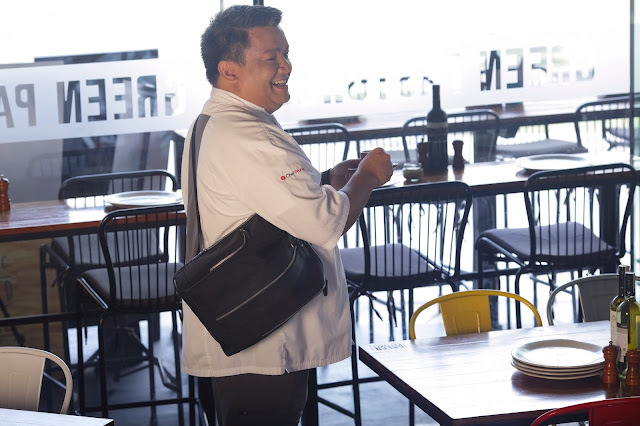 With such a busy schedule, Elbert always takes a bag with him that fits everything he needs. The FINO zip-up tote Elbert co-created is reminiscent of a bespoke vintage race car bag sporting a number in front, reflective of his love for racing, which has taken center stage in this collaboration. The distressed brown and gray leather definitely lives up to that retro feel. Albert's piece is a messenger-tote bag, is designed so that it doesn’t swing while biking. The compartmentalized bag was designed to be home to his life’s essentials and needs, like laptop, gadgets, chargers, and cables; personal items like my glasses, grooming products, and checkbook; and things for work like folders. He made sure to include an outside pocket, where passport and boarding pass go. A trolley sleeve, which you can easily slide over your hand carry luggage. The double straps, which have racing stripes, are short enough to hold in your hand and long enough to wear on the shoulders. It also has a detachable strap, whose length can be adjusted, so that the bag can be worn as a cross-body or as a bike bag on your back. Monchet Olives career began in the 80s when he created and brought to life concepts that made life for the Filipino better, such as, TFC Channel, which brings the Philippines to millions of OFWs all over the world and the Pasig river clean-up project, Kapit Bisig Para sa Pasig. Part of the campaign was a fun run that bagged the title of “The Biggest Run” in the Guinness Book of World Records. His dream bag is brought to life with FINO, designed to allow you to store your fan, and many other essentials, in the most stylish way. The outcome was a smooth, leather, two-tone, compartmentalized man clutch with a fan pocket on the outside, perfect for times when one needs to bring a fan and to use a small clutch also. The variant he uses is red and black, his signature colors. The piece also features a small card case as well as pen case, smartly conceptualized to be compact and flexible. Chef Robby Gocco is the man behind CYMA, Green Pastures, and SOUV. Chef Robby enriches the lives of not only his customers but also his employees. He shares how some of his employees have sent their kids to college, leading to good employment afterwards. His FINO bag is a medium sized backpack-sling, leather-nylon. 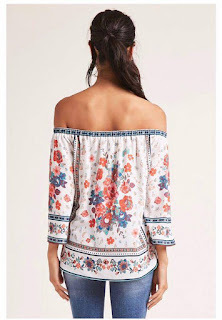 It is rugged, not at all formal. The easy-to-wear fusion back sling was a result of experiences from both work and leisure, championing creativity, convenience and innovation. Aside from his business related activities that include meetings, going to the market, running a kitchen, he also needed a bag that he could use for traveling. You’ll immediately see his keys attached in front, which shows how mobile he is. The bag is made up of several secured compartments, which is fitting for his multifaceted lifestyle as well. 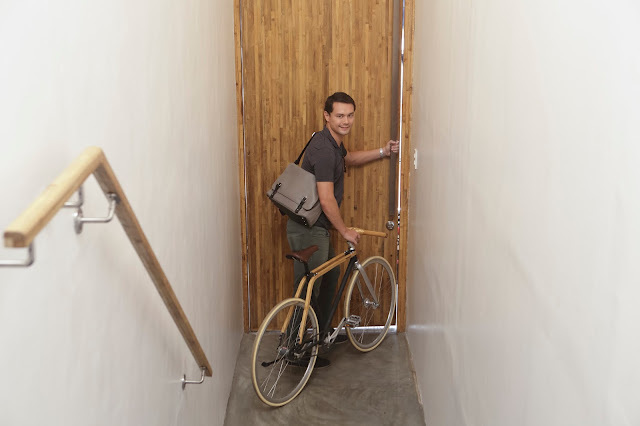 Bryan MCCleland is the owner of Bambikes or bamboo bike, and turning it into a sustainable business. If you happen to be in Intramuros and see a set of people circling the walled city in Bambikes you would have seen part of the realized vision of Bryan. Behind Bambike are the Bambuilders from Gawad Kalinga, an organization dedicated to providing sustainable livelihood for some of the less fortunate communities in the Philippines. His company, Bamb Ecological Technology has so much promise for the future. His leather messenger bag is fit for someone as active and as outdoorsy as Bryan is. Constantly biking from one commitment to another, he needed a bag that was durable, compartmentalized, and flexible. This rectangular, tough but classy leather and canvas bag has enough compartments to carry items like a water bottle and other work essentials, while still having room for a cellular phone, a laptop, a wallet, and other work essentials. Perfect for the adventurous commuter. Bryan was very much involved in the design, creating a bag that is personalized and suited to his own lifestyle. The perfect companion for the active gentleman, you can just sling it on and go. He ensured that he can easily and conveniently slip all of his daily essentials into the bag as he treks through History traffic, while protecting his valuables and belongings as he braves the pollution and dust he encounters during his city rides to get to his meetings. Just like his Bambikes, Bryan’s unique FINO piece is ruggedly stylish and functional, durable and versatile. 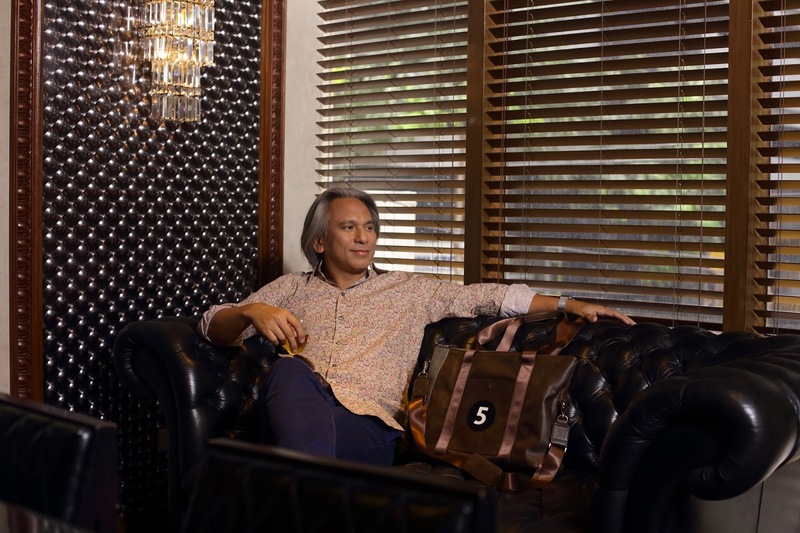 Eric Paras is the interior designer who designed the sophisticated The Henry Hotel in Pasay. Finding the perfect harmony, he took both old-world and modern elements and fused them to create a welcoming, inspiring, and comfortable sanctuary. Being all about form and function, the bag he designed with FINO is just that. As simple as it appears, a lot of thought was put into developing it. It’s a utilitarian, rectangular, easy-to-match tote containing a detachable clutch where a man can choose to put his essentials. It was designed in a size perfect for carrying folders and other documents needed by an artist or creative spirit. Being composed of mostly nylon makes it very light despite its generous proportions. Raul Rona is a director, awarded for a number of his works including Best Director (Ad Congress) for PLDT, Monde Nissin, Procter and Gamble, and Coca-Cola. Being a seasoned professional, he has seen the change in the media landscape. Besides being a top advertising director, Raul is an elite motorcycle rider who bikes across the globe. 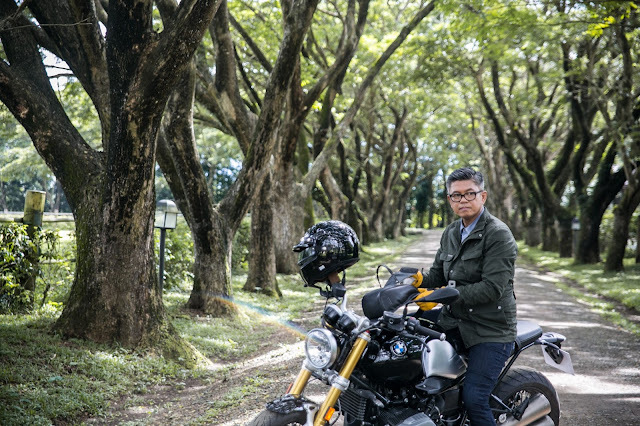 In his most recent adventure, he served as road captain of the first Filipino motorcycle team to ride up the most dangerous road and highest motorable peak in the world at more than 8,000 feet, the Himalayas. Similar to his personal style, the FINO bag he co-designed is understated but functional and comfortable to wear. Featuring multiple compartments, the curved leather man sling, which also doubles as a backpack, is small and easy to carry, yet still big enough to carry one’s needs. The front of the bag features zippers on each side as well as scraps for closure, perfect for someone who is constantly on the move. At his young age, Carlo is riding high in the digital landscape of the Philippines. He is now VP of Digital Strategy and Disruptive Business for PLDT. “The modern consumer is more discerning because they are empowered with digital to make better choices,” he shares. “The consumer is changing from the way they buy, communicate, and consume media, at a rapid pace. 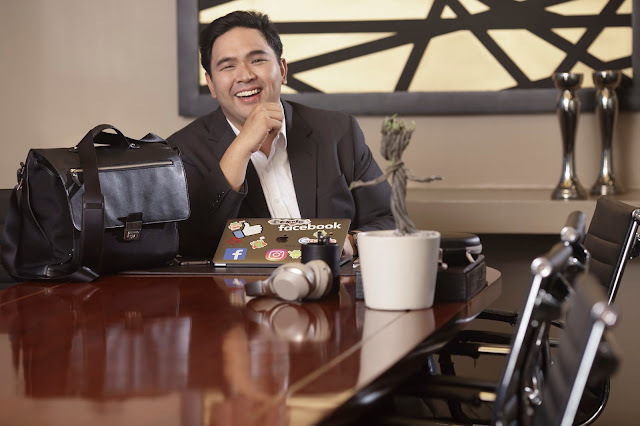 The challenge for marketers is to be able to keep up because when they don’t, they are open to disruption.” He also founded Unbox.ph, which has one of the highest traffic for technology lifestyle sites in the Philippines. His attention to detail and drive towards perfection is seen in bag he designed with FINO, a bag for modern-day executive that was built to carry stuff in a purposeful and stylish way. It is a hybrid leather-canvas messenger bag, with a removable organizer for his gadgets. It also has a card and pen holder at the front interior of the bag. This versatile bag can be used for both formal and casual occasions. FINO Leatherware, applauded for their soulful collections like FINO NOW and the Vinta Collection actually began with a line for men way back in 1992. Known then as the Business Line, the collection featured the original envelope folios, leather jotters, agendas and briefcases—which as fate would have it, is what brought the company to leather and to what we know today as FINO Leatherware. The previous collection, FINO NOW, featured collaborations with women who have made their mark—. Through these collaborations, the FINO NOW campaign celebrated the Filipina—her accomplishments, failures, journeys, destinations, while encouraging and supporting her to keep dreaming, pursuing and finally actualizing her passions and aspirations—now. 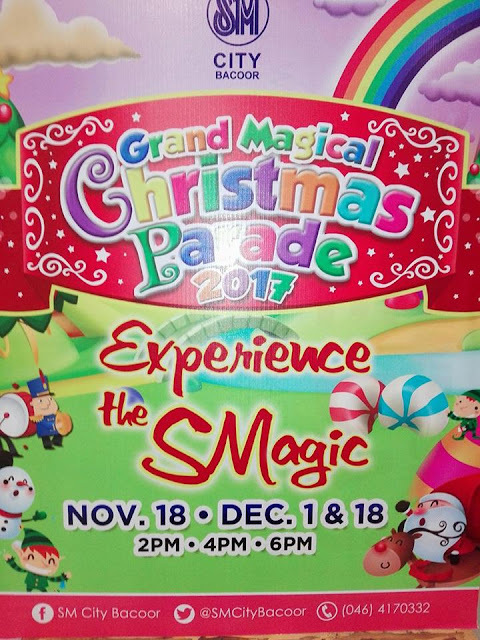 SM Supermalls in South Luzon is giving you 100 reasons to experience the SM Magic through the biggest and much-anticipated Grand Magical Christmas Parade! 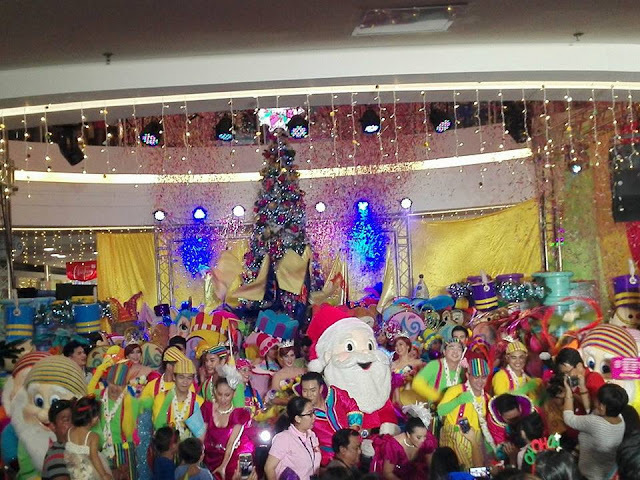 Now on its 6th year, SM South Luzon’s Grand Magical Christmas Parade is an annual parade of colorful and vibrant holiday icons which has put countless smiles to everyone who visits SM malls either to shop, dine, or to simply enjoy the show. 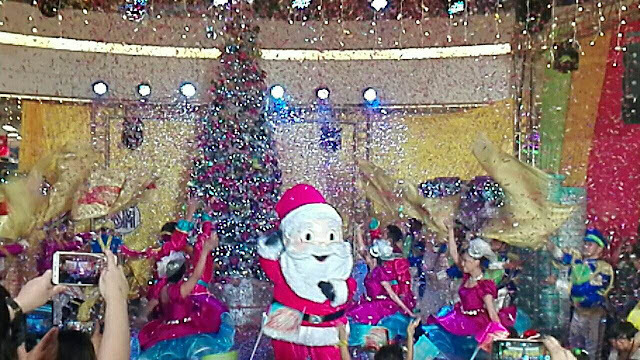 This year, SM made it bigger and more magical as they bring 100 Christmas characters to life! The grand launch was held at SM City Bacoor last November 18, 2017 where well-loved Christmas icons such as Santa, toy soldiers, princes and princesses, elves, and cuddly teddy bears will mesmerize not just kids but the entire family as well. If you missed this spectacular event, you still have a chance to experience SM’s Grand Magical Christmas Parade at the nearest SM South Luzon mall! If you're craving for authentic Chinese food but hates the traffic in Binondo Chinatown, I suggest you try Templo Modern Szechuan located in Banawe, Quezon City. Templo may have a small space but it does compensate by offering flavourful fusion of Chinese food we all love. The menu features a variety of Chinese dishes that uses high quaity ingredients. To name a few, Empire Abalone Stew, Sweet and Sour Kurobuta Pork, and Szechuan Saikoro Beef Sausage, Ginger Shrimp with Taopao, Empire Seafood Roll, and Halibut Chong Qing Style Soup, Pork Ear Vinaigrette in Coconut Milk, Special Spicy Chicken Liver, Black Chicken Soup, Crispy Xiao Long Bao, Golden Squid Ink Hakaw, Salted Egg Buns, and Salted Egg Kuchay Dumplings. For desserts try Templo's Signature Milk Tea, Avocado and Milo Coated Ice Cream. The #Mendiolables had the following during our visit, Hakaw, Beef Lettuce Fried Rice, Yang Chow Rice, Szechuan Saikoro, Szechuan Sliced Pork, Garlic Spare Ribs and Salted French Beans. The Brightest Christmas celebration was just unveiled as SM City Clark and SM City Pampanga a kicked off Pyro Fest 2017 at SM City Clark’s The Meeting Place. which started in 2012. Guests, shoppers, media and all expectators were amazed when the sky was filled with colorful and creative display of fireworks. Tickets are sold at P100 at the mall's selling booth at the main atrium or at www.smtickets.net. My family and I were able to see dazzling display of multi-coloured three lights shows in Singapore. Thesee include the stunning Garden Rhapsody at Gardens by the Bay, The Merlion at Imbiah and at Marina Bay Sands (I can't find the video file though). All these Singapore light shows are free for all to watch and make great entertainment for all the family so don't forget to put it as to do list when in Singapore. Due to Asean Convention classes and offices in Manila were cancelled and it was a perfect opportunity for us to use the overnight accommodation of Belmont Hotel which I won at Pasay Tourism Event raffle last . Thanks to Joy Felizardoand her sister-in-law for this invite. 2. Very accommodating staff, namely Kristoffer of the front desk and Jana Agustin of Cafe Belmont. 3. Gym, steam and sauna room. The swimming pool, which is located at the roof deck, is a bit small and was too crowded so we weren't able to swim at all. It's also a bit taxing for guests who has difficulty walking to go to the pool because the elevator is up to 10th floor only then one must climb series of stairs. The room and the bathroom may be small but it was clean so it's okay. We were not able to sleep in the afternoon as the cellphone of the other guest beside our room kept vibrating. It took several calls within 3 hours before our concern was given attention. The hotel manager only went up to check the matter when I urged the telephone lady to ask the manager to go up and check our room. Miraculously the cellphone just stopped as soon as the hotel manager came into our room, probably the battery was drained. Do the Mendiolables recommend Belmont Hotel? Yes, if you want a place near the airport and if you have more money to burn. Otherwise, you may opt to go to other nearby hotels that offer lower price but better facilities. Today is the celebration of View Park Hotel's 10th Year Anniversary and I'm happy to be a part of this warm and homey place. My family and I have many wonderful moments with View Park starting in 2014. Since then whenever friends and relatives asks for what hotel to go to in Tagaytay, I always recommend View Park Hotel. Why we love VPH? The place is relaxing, the food in Siglo is delicious, the people are warm. Plus, weekend performances by Acoustic Impressions is great! Ate Coy and I aren't biological cousins but it feels like it. Ate Coy is the wife of my cousin Kuya Virgil so it follows that she and I became cousins by law. It doesn't just stop by law, Ate Coy and I became very close since she married Kuya Virgil. She just turned 50 yesterday. Ate Coy's 50th Birthday Celebration was spent with her elementary and high school friends at Tipanan last Saturday. John and I were invited by Ate Coy and were actually surprised that we didn't feel out-of-place. We enjoyed the night as the golden girl and her friends danced and sang the night away. "There’s nothing stressful about turning 50 – except people reminding you about it." "When you’re 50 and wake up without any aches and pains, you know it’s going to be a good day." "In your 20s: Looking for your perfect match. In your 50s: Just happy if your socks match." Mcdo in collaboration with SM Supermalls will bring delightful happenings for the whole family. They started at SM Megamall where parents, children, lolo, lola, tita and tito had fun with the activities in different booths, namely, Slide and Climb, Card Making Contest, Hugs and Kisses, Stripes Run, among others. The #NationalThankYouDay will tour at SM Megamal and SM Faitview on November 11 and 12, SM MOA on November 18 and 19. And will culminate at the SM National Thank You Family Fun Day at SM MOA on November 26. All Mcdo stores located in 47 SM Supermalls will give a free Sundae Cone for every purchase of a Happy Meal from 3pm to 6pm. There will be Pinoy Thanksgiving at SM from November 20 to 26, Thanksgiving Parade on November 24 to 26, and Mass on November 23 at select SM Suoermalls. It was a fun-filled night as Disney's Tsum Tsum Christmas Tree was unveiled at SM City North Edsa! Mickey and Minnie and the rest of the well-loved characters in the Disney's Tsum Tsum animated Youtube shorts are featured in a gigantic 45-foot Christmas tree! To complete the Tsum-tacular Christmas Village, winter town and park setting with train display is available for shoppers to enjoyuntil January 7, 2018 at the The Block Atrium, SM City North EDSA. Celebrate magical season with your family at 65 branches of SM Supermalls nationwide. Gelare airless ice cream from Australia is now in the Philippines as they welcomed media, bloggers and guests at their flagship store, located at the 3rd level of Uptown Mall n BGC. What makes Gelare a better ice cream? #Gelare is an airless #icecream from #Australia, unlike other regular ice cream that contains 50% air. Meaning you get your mney's worth because you're eating 100% ice cream not 50% air and 50% ice cream. Considering that I'm not into ice cream, I like most of their ice cream because my throat didn't react negatively. I usually get sick everytime I eat ice cream but not with Gelare. I personally prefer their dairy-free & vegan ice cream line. that's clean tasting, smooth and 100% lactose friendly. My favorite is the Lemon Lime and Lychee Lane Sorbet. For ice cream, I'd say, you have to try Macadamia Nut, Chocolate Chip Cookie Dough, Honey Malt Crunch and Strawberry. They also offers all-day breakfast and desserts and coffee. I got to try Waffle & Buttermilk Chicken with Gravy (P329) created by Chef Aileen Anastacio for Gelāre Manila. The waffles are cooked upon order with their unique waffle base made from natural ingredients served with cream and their signature maple syrup. Personally, my favorite would be the Waffle with Honey Malt Crunch with Affogato of Chocolate Chip Cookie Dough. Founded in Australia in 1986 by Mr. Farid Torabi, Geláre with over 50 branches spread across Australia, Singapore, Hong Kong, Malaysia, and Indonesia. The store offersits famous ice cream, waffles, pancakes, hot beverages, smoothies, and light breakfast menu. WhitePlates Inc. brought Geláre in the Philippines. It was a rainy-happy night at SM MOA as they unveiled their giant Christmas tree during the Very Moa Christmas event. The highlight of the event was the lighting of the 50-ft Christmas tree and the show stopping performance of Acrobat Troupe. The crowd, kids and adults alike, were surprised when balloons dropped. Some of ballons has stickers with corresponding prize from SM Supermalls Brands and Partners. There was also a meet and greet with Santa Claus, which my sister and I enjoyed. Santa remembered me from last year's event and he invited us to immediately line up for photo op with him and the pretty elves. Madame Tussauds is a wax museum founded by wax sculptor Marie Tussaud in London. It has smaller museums in a number of other major cities. My family and I got to visit Madame Tussauds in Singapore where I met my favorite Oprah and my futire husband Brad Pitt in wax form (lol). Our trip to Petronas Twin Towers was cut short because we enjoyed Legoland and stayed longer than what we planned. Our online booking also had some problems. We were supposed to leave Legoland by 12nn but the bus we booked left at 7pm. At the bus, we also had problems with seating arrangements. We arrived very early and was able to seat in front but we were told to seat at the back. Good thing there was a Malaysian who can speak English well. He assisted us and was given a better seat. My husband and Jesu Dasan had conversations all throughout the bus ride. When Jesu learned we were just there to see Petronas he was kind enough to offer us a ride to his van. It was a 45 minute drive from the bus station to Petronas. Jesu didn't asked for a single ringgit. God is great by sending us Jesu. If not for him we would have gone straight to the airport and missed Petronas Twin Towers. We arrived in Petronas at almost 1 in the morning. Good thing the guards allowed us to take some photos and quick videos for this vlog even if the towers is closed by 11pm. If you plan to tour Petronas Twin Towers and the nearby tourist spots, I suggest you hire a tour guide so you can visit as many places as possible in one day.